One Eternal Day: Is God really like Jesus? 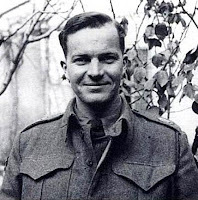 On the one-hundredth anniversary of his birth, something about the theological contributions of Thomas F. Torrance. .... As a chaplain during World War II, he came across a young soldier, scarcely twenty years old, who was mortally wounded. “Padre,” he asked Torrance, “Is God really like Jesus?” Torrance assured him, “He is the only God that there is, the God who has come to us in Jesus, shown his face to us, and poured out his love to us as our Savior.” As he prayed and commended him to the Lord, the young man passed away. A few years later, one of his parishioners in Aberdeen, a dying, elderly lady asked him the same question: “Dr. Torrance, is God really like Jesus?” That this doubt arose from among believers within the Church itself troubled Torrance deeply. He wondered how the Church distorted its message and created obstacles for its members that kept them from joyous participation in communion with the living God that was theirs in Christ by the Spirit. The article is titled "What Scientists Get, and Theologians Don’t, About Thomas F. Torrance," and that is the subject of most of the remainder.